1. I went to see “The Hunger Games” with two friends from work, who I don’t hang out with socially all that often. In addition to seeing a really good movie, I also got a reminder that I am lucky to have colleagues who are amazing, interesting, and fun people. 2. After weeks of stress resulting from being shut out of the Ticketmaster sale for tomorrow’s Springsteen concert in DC, I get a two-line text from my brother yesterday: “We’re in for Bruce – 114 row O. Side stage by Roy! !” I cheered and clapped so loudly that I startled my officemates. 3. Walking around the neighborhood after brunch with my friends Julia and Michael today, I got to sniff my first lilacs of the season. 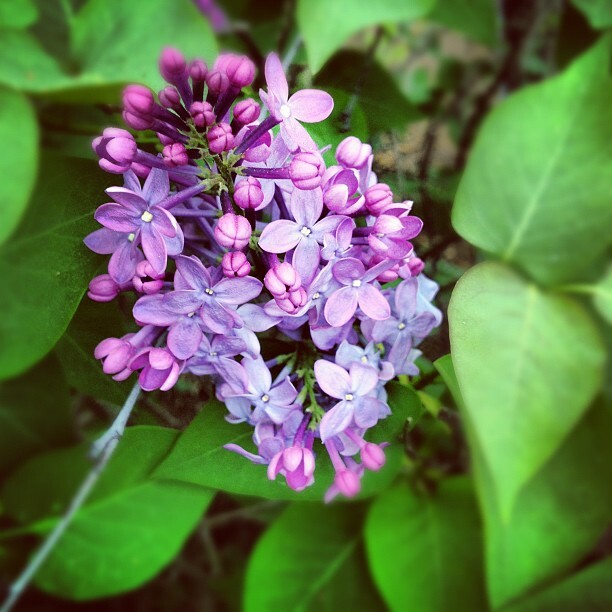 Nothing smells like spring – and home – like lilacs. 1. Dropped the kids at their schools and proceeded directly to the movie theater to catch The Hunger Games, which wrapped up in time for me to pick up the first kid from school (had no appointments or commitments…felt like I was playing hookey from school). Had a great time. 2. A friend I’venot been able to connect with for awhile was in the neighborhood and stopped by. A very nice, all-too-brief chat ensued. I sure cherish that kind of a pleasant surprise! 3. A friend’s CEA dropped to 2.3 (had been over 58 at one point)!!!!! !